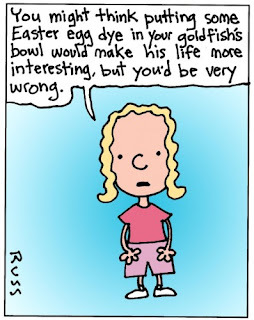 This cute Shoebox blog cartoon brings back great Easter memories. When I was young my mom always bought us new clothes to wear to church on Easter - surprisingly I enjoyed that. We would also dye eggs and my folks (and my older sister) would always hide our baskets on Sunday morning. It was great fun searching for them. Easter dinner was always a feast made by my dad. He was such a great chef! When we had children I continued all of those traditions. The images of my kids searching for their baskets warms my heart. Not to mention how they loved to find hidden eggs in our backyard. What kind of Easter traditions do you remember? My wife has more family traditions than you can shake a stick at! We'll be hiding eggs for the grandkids to find this Easter just like we hid them for our kids and our parents hid them for us. Ain't family traditions fun? We dyed Easter eggs when our kids were young. One Sunday we came back from church to find that our cocker spaniel had climbed up on the kitchen table and eaten a dozen dyed eggs, and the cardboard holders. The dog spent the afternoon in the basement throwing up. Needless to say, we weren't very pleased. We actually don't have any traditions. We don't see this Lord's Day as any different than any other Lord's Day. We celebrate the resurrection everyday of the week. So we shall gather with the body, but come home and have a normal meal and probably read. We never did the egg or bunny or basket thing. Come to think about it now, I wonder if it is too late to ask Irene to have some ham tomorrow? Happy Resurrection Day to you and yours and to all your readers! We did all of those things, but one year when the grand children were a little older we held our first "Flash Light" Easter Egg hunt in the back yard, after dark. I bought flash lights for everyone at the Dollar Store, and they got to keep the flash lights. It was really watching them all over the back yard w/ their lights searching for eggs. Is Your Back Out of Whack? What ever happened to the (not George) Foreman? Remember back when you knew everything?